Quote Chief look at the vast number of cars being impounded in England and Wales – and how police forces are making millions from selling confiscated cars. Across the UK, police forces have seized and impounded over 22,500 uninsured vehicles in the first half of 2016. The majority of seized vehicles are collected by their owner once they have taken out impounded car insurance but some are sold at auction or even cashed in as scrap. Police in England and Wales have made over £1.6 million in the first six months of 2016 from selling cars seized for being driven without valid insurance. Insurance provider, Churchill, have revealed statistics from recent research that has shown that 22,594 vehicles were seized by 43 police forces in just the first half of this year. Of these vehicles 2,866 were not collected by the owner and were subsequently sold at auction while a further 6,827 uncollected motors were sold as scrap. Motorists caught taking to the roads without insurance can be punished with a £300 fine and six penalty points as well as receiving an IN10 conviction on their license. If for any reason the courts are involved in the case, they have the authority to increase the fine to an unlimited amount and the guilty party could even be banned from driving. On top of the penalties handed out by authorities, police also have the power to seized uninsured vehicles and take them to be impounded. This could leave the driver in a sticky situation, as there aren’t many providers that offer insurance for impounded cars – and there’s only 14 days to collect an impounded vehicle before it can be sold or crushed. The Metropolitan Police in London were brought in the most cash from selling and scrapping seized vehicles, having raised close to £900,000. 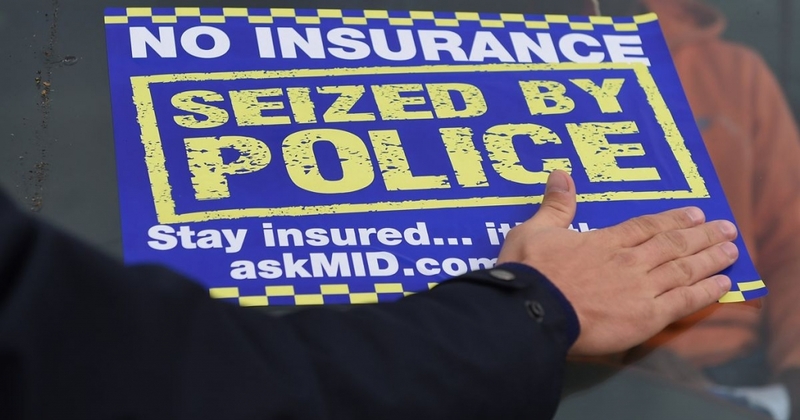 In the first six months of this year the Metropolitan Police have confiscated 6,827 uninsured cars. The research suggests that London has the highest percentage of uninsured drivers out of any area in England and Wales, with approximately 5.5% of all cars on London’s roads being driven without cover. Unfortunately for law-abiding motorists they have a 1 in 18 chance of being involved in an accident where the other driver does not have any car insurance. Greater Manchester’s police have also been very busy seizing 3,488 uninsured vehicles in the same period – the second highest by area. With insurance prices soaring only time will tell if more drivers will take to the road without cover in an effort to avoid paying a hefty premium. With police forces cracking down on uninsured drivers, though, one thing is certain: you’re more likely than ever to have your vehicle impounded if you risk driving without insurance, and the financial strains this can bring far outweigh the cost of taking out cover.